This article is about the version of Olaf One-Eye encountered in Sovngarde. For the draugr version encountered in Dead Men's Respite, see King Olaf One-Eye. If you have completed the quest Tending the Flames, Olaf may greet you by saying: "You freed Svaknir, a fool of a poet, but an honest enemy who has earned my respect. Sadly, he's now lost in the soul-snaring mist - defeat Alduin, and his doom avert - I hope to greet him in this Hall as a friend." 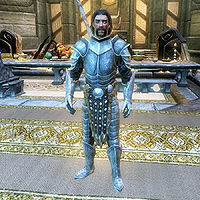 He wears a full set of steel plate armor, except the helmet. He carries a steel warhammer. This page was last modified on 27 December 2017, at 02:58.